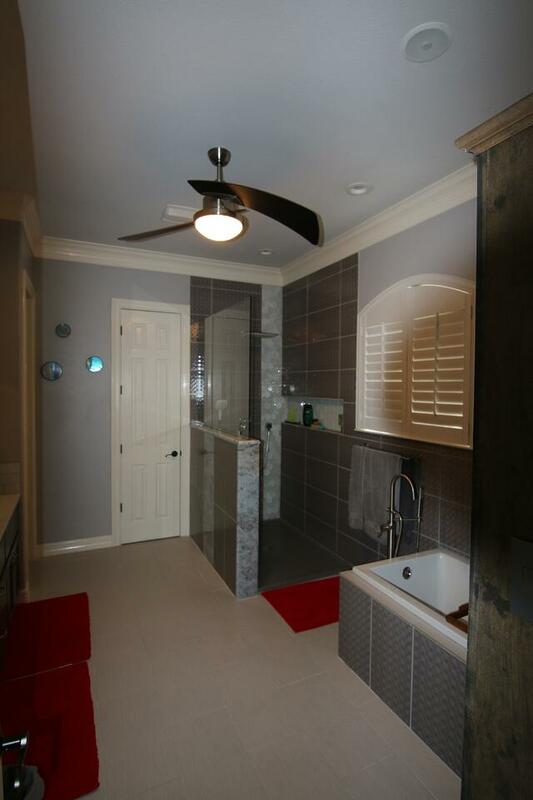 We are a local general contracting firm specializing in both kitchen and bathroom remodeling projects in the Austin area. Reasonable timelines and project costs can be known to you the consumer by creating a complete scope of work! T-Square Company has over 30 years of remodeling experience and offers in house design/build opportunities for it's bathroom and kitchen makeover customers! We are an A plus accredited member of the Central Texas BBB since 1988 with over three decades of experience! We specialize in solving all ADA compliance issues, handicap home modifications, and problems associated with aging in place. We are nationally CAPS ( #1636580) certified! Find out also how an accessible bathroom or kitchen can give you back your independence and safety! With over three decades of building experience in Austin, Texas we can make your bathroom remodeling or kitchen remodel project an enjoyable experience. Additionally we also offer bathroom accessibility remodels Austin and ADA Accessible Kitchens for our aging in place customers. We incorporate Universal Design in our Projects providing accessibility to all regardless of their age or physical well being. Why not design your new space in a utilitarian way? Simply fill in your contact information and let's get started TODAY! Give your bathroom design a boost with a little planning and our inspirational bathroom remodel ideas with T-Square Company. Whether you're looking for bathroom remodeling ideas or bathroom pictures to help you update your old situation for master bathrooms, guest bathrooms, and powder rooms we can help. High-design trends not only look beautiful but add value to your bathroom remodel. 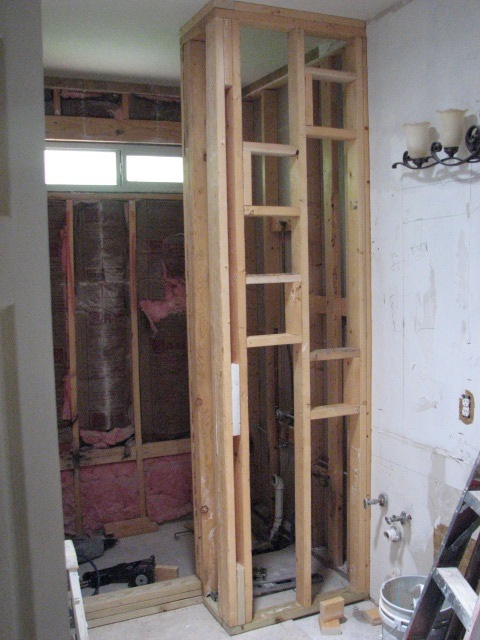 One of the biggest mistakes homeowners make when taking on a remodeling project is not planning ahead. Approach your contractor with many examples of your remodel ideas, including pictures from home decor magazines, links to bathroom design ideas on the web and paint chips from the hardware store. The more information you collect conveying what you want to achieve the more the experience of your chosen bathroom contractor can help you through the entire process. If you find yourself falling in love with say teal or red tiles for your shower wall, try to remember that once your shower is installed, you’ll want it to stand the test of time. Even though you love those colors today, you may decide that they don’t fit in with your next renovation project or they may fall out of favor and make it hard to sell your home someday. If you’ve decided that you just can’t go without your color of choice, think about including it in easier to replace items, like your towels or other decor elements. Your new shower should definitely reflect the feel of the home and your special touches, but it should also be easy for a potential buyer to move in and make their own mark. Planning a kitchen renovation? Explore many kitchen decor ideas and get inspiration to create the kitchen of your dreams. Upgrading a kitchen is full of possibilities, and even a few simple budget ideas can refresh, modernize your kitchen design.There are many ideas you can implement to maximize space, improve aesthetics and ergonomics, and generally make your small kitchen a happier place without breaking the bank. Let our over three decades of experience help guide you through the kitchen remodeling process. 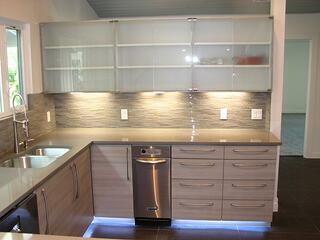 Adding cabinet accessories to your kitchen project is one of the easiest ways to personalize your own kitchen. There are many different storage options for everything from spices to silverware to best fit each family's space and lifestyle. The kitchen is always a favorite room to renovate. The heart of a home is almost always the kitchen. It’s where people gather and where meals are prepared with love.But it’s also the room that sells homes and begs for improvements. And because an updated kitchen can add significant value to a home, it’s usually the first project that homeowners tackle when moving into a new home or prioritizing renovations. You know you want a new look for your kitchen, but can’t decide what to change. Whatever you decide, make sure it’s timeless. Quartz counters, updated appliances or a new back-splash are great additions to any home regardless of the decade or trends. The important thing here is avoid giving in to fads like farm sinks, colored apliances, or trash compactors! These fads might not be long-lasting, and they can leave your kitchen looking tacky and, even worse, make it lose value. From small kitchen designs to full custom kitchen remodeling, we can help. Once you’ve transformed your kitchen, you’ll want to show it off. 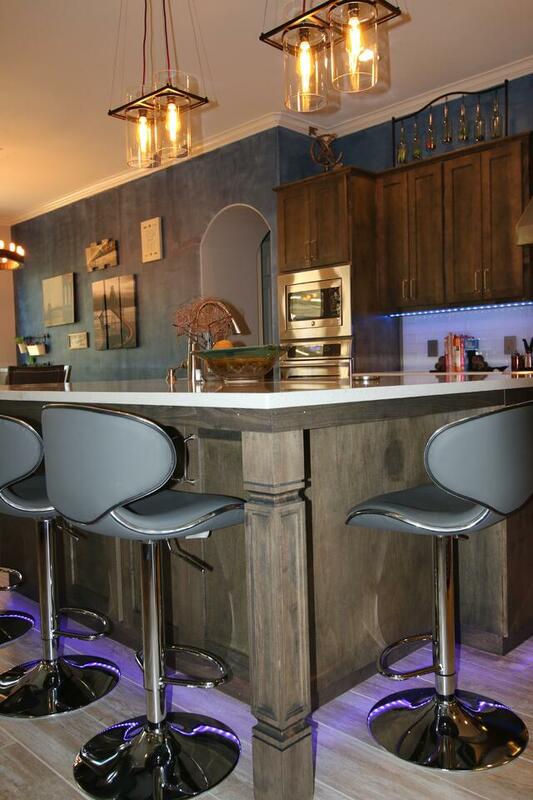 When planning a remodel, look for opportunities to open up the space and incorporate more seating options, like a breakfast table, a corner bench, or add a bar top to your kitchen island and bring in a few stools. 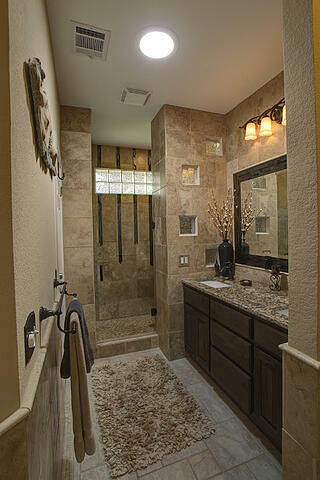 A striking example of our fine bathroom remodels!